If you used Boardbooster before it shut down, chances are that you’re familiar with the concept of “looping” your pins. I for one love any chance I have to put more automation into my business, and I’ve been waiting (not-so-patiently) to have a crack at Tailwind’s Smart Loop feature! SmartLoop is a brand new feature on Tailwind that’s been rolling out to users over the past several months. SmartLoop takes your older content and repins it again on a schedule, bringing it to the top of your boards and allowing it to be seen again in your audience’s feeds. Because SmartLoop is part of Tailwind, it has access to all your pin analytics - meaning it will provide statistics and suggestions to help you select which pins are the best choice for your loop. 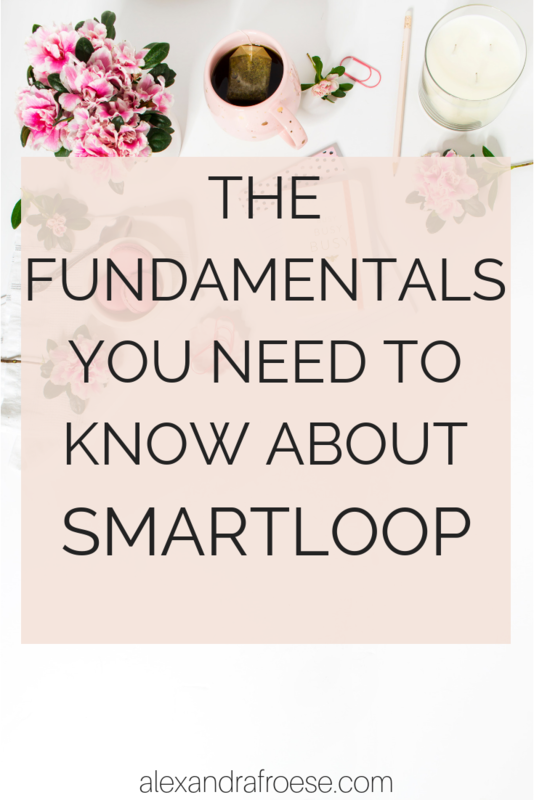 The best way to learn how SmartLoop works is by setting up your first Loop! First, you’ll want to head to the SmartLoop dashboard, underneath the Publisher tab. Here is where you choose which type of loop you’d like to create. You have two options: Seasonal or Evergreen. Seasonal loops are for content you want to share around a specific season or date - for example, holiday gift guides or a product launch. This is so handy, and ensures that nothing gets forgotten or missed in the hustle and bustle that surrounds important dates. Evergreen loops are for your everyday content. This is a good way to keep your opt-in freebies circulating and keep your older-but-still-relevant content appearing in your audience’s SmartFeed. After you’ve selected the type of loop you’d like to create, it’s time to name your loop. It doesn’t have to be anything fancy - just a simple name so you know what the loop is dealing with - like “Christmas Content” or “Sewing Course Launch”. Use the category/topic, holiday/event, or names of specific boards in the loop. Once you’ve named your loop, move on to select the pins you want to be looped, and the boards you want them looped onto. You can filter the pins by the board, your domain, most recent, or most popular. You can select whether you want to loop the whole board or just specific pins. You can also set up “board rules” that tell Tailwind how often to pin to a specific board - this is really handy for those group boards with daily pin limits! Once everything is set up, you can see an overview of how many times per day each loop will be pinning, how long it takes to pin through all the pins in the loop, and the typical daily ratio of looped to scheduled content. It’s possible to customize how many times per day SmartLoop posts, but the feature is designed to figure this out for you, taking analytics (and Pinterest’s spam filters) into consideration. Phew! That was a lot of information. I’m so excited about this feature - I’ve truly missed that “next level” of automation that was possible, and I’m thrilled that Tailwind has found a way to make it both useful AND follow the rules of Pinterest! First off - let’s chat about cost. This was something that I had to dig in order to find. PLUS Plan members (if you’ve paid for the basic level of Tailwind) get 250 loop posts - not 250/month, 250 IN TOTAL. I’m not sure if I missed some small print somewhere, but I didn’t realize the limit wasn’t monthly until AFTER I’d used most of it. If I had, I probably would have been a little more conservative with my first loop! The paid plans are pretty low-cost though, starting at just $7.50/month ($5/month if you pay annually) added to your yearly membership. Each time a pin is pinned to a different board, it’s considered one loop post. If a pin is saved multiple times to the same board, that’s considered one loop post as well. The SmartLoop algorithm determines the best time to loop the pins, as well as randomizes the order of the pins to the boards you selected. If you’re not already using SmartLoop, go save your spot now! They’re hoping to have the feature rolled out to all users in the near future, but getting in early is always handy. If you haven’t signed up for Tailwind yet, you can sign up through my affiliate link here. Still struggling with getting started on Pinterest? Download my FREE Beginner’s Guide to Pinterest workbook! Your download should be on its way shortly. I'm a planner-loving, Starbucks-obsessed Pinterest Strategist & Instagram Manager hailing from Manitoba, Canada, where I live with my husband and two children.